Probably the most used tool for pin repair is the hollow shaft, thin wall, nut driver. 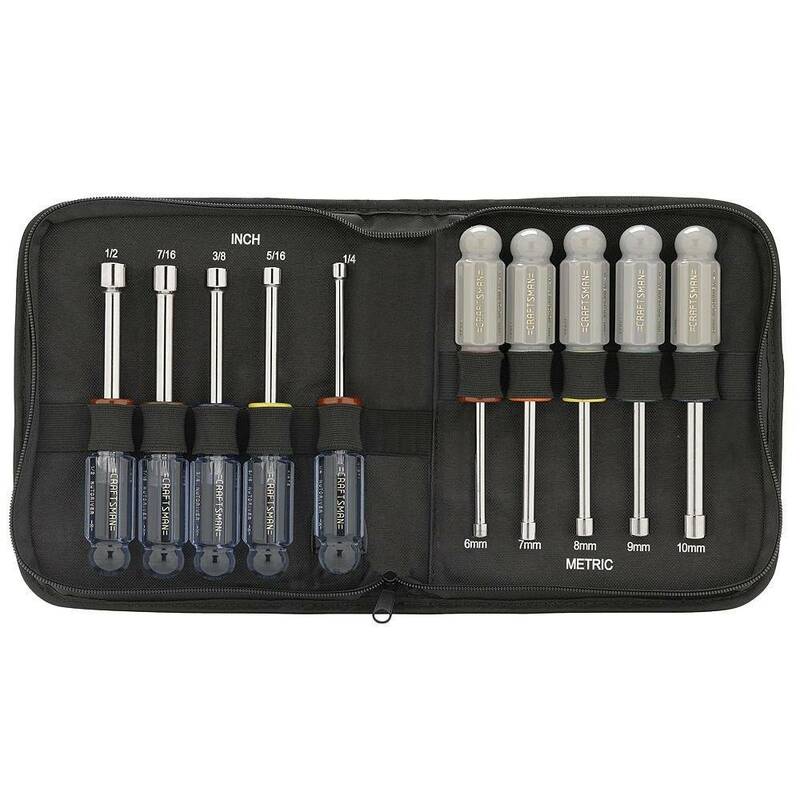 Faster than you can find the proper socket for your wrench, this is "the" color coded nut driver set. The set uses the same colors as the one your grandfather had, so the red is the familiar 1/4", the yellow 5/16"... you get the idea. The shafts are hollow, so the screw threads enter it without the need for a deep well socket or open ended wrench (you need this for pop bumpers). Some electricians use shrink tubing to insulate the shafts. Shrink the tubing first, THEN trim it flush with the end of the socket. Thanks vid1900 for the link and info. you provide on this--and all you have contributed to Pinside over the years !!! Because of the hollow shaft, these do not have the little magnet in the socket like Klein. Leave them stuck to a speaker magnet, in a single position, for a week or so, if you want them magnetized. Needed a new complete set. Ordered - thx! Isn't 11/32 used in some games? Noticed this set doesn’t include it... still a pretty good deal and you could always supplement with a one-off additional one. Got me again Vid. Grazie. I think one of the metric ones will work in a pinch. Can anyone confirm this? Thanks for the tip. I just bought my first pin and I wanted to start getting the right tools. Picked up the set today and ordered my first mod. I've been using this set, and I really like the large handles and 5" shaft: keeps your hand clear of the mechs and wires. Just came in the mail today. Very nice... thanks Vid! I picked one up today, thanks Vid. Was very impressed with the "buy online pick up in store" process. Swiped my credit card when I got there and 82 seconds later they handed me my kit. Just can't help wonder if that's my last Sears purchase ever? Kinda sad that it's come to this. And it's 20 min to the closest Sears store so, I had to ship it. I hope they can pull out. I worked for Spiegel Catalog for 15 years; the four "P's" killed Spiegel: Paper, Printing, Postage and Phone costs. Actually, now that I think about it, back in 1995 Spiegel bought the Sears warehouse in Columbus Ohio when SEARS got out of catalog. I went to that warehouse a few times.. it was AMAZING! Being in IT I rarely had to visit the warehouses but I was privileged to see the 35th street warehouse in Chicago several times before it shut down and the Newport News Warehouse in Hampton VA AKA "The Wolf". I bought a set of these a few years ago on Sears Black Friday sale to keep in my game room and I love them. The only problem is , I am always borrowing them to use else where and they are never in the game room when I need them and I'm always having to hunt them down! Just bought two more sets to put in my shop and service truck. Problem solved! You can just open your pin, stick the heads to the speaker magnet in the cab, don't move them for a few days, they will be magnetic.